Members of Storefront for Art and Architecture are invited to a tour of ALL THAT IS SOLID, the current exhibition at PROXYCO Gallery. The tour will be led by artist Pablo Gómez Uribe. Pablo Gómez Uribe uses his practice to investigate manifestations of social and political conflicts in urban environments, highlighting how traumatic events create new literal and psychological landscapes in cities. Gómez Uribe has previously worked with Storefront as the designer of the mayoral desk and architect’s table for Letters to the Mayor: Bogotá. 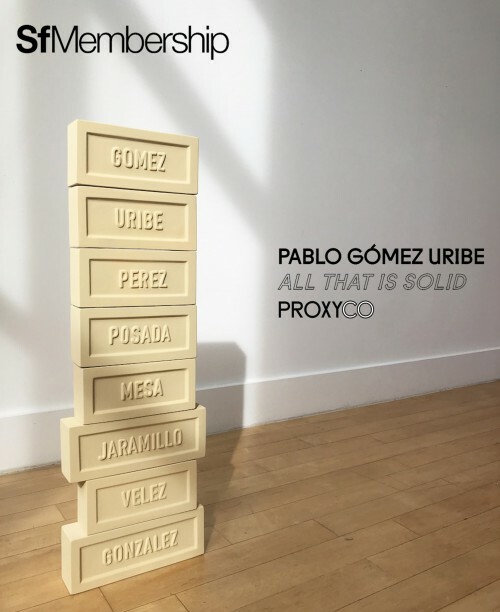 ALL THAT IS SOLID showcases recent work by Gómez Uribe that explores the notion of architecture as progress. The exhibition presents material tests for the building of a new fictional city, “Medenyal,” which has roots that lie in the demolished buildings of the artist’s hometown of Medellín. The show also puts forth proposals for new types of bricks made from the ruins of buildings and other materials, as well as exploratory artworks that problematize the relationships between memory and industry, culture and displacement, and dilapidation and development. This tour is open to members of Storefront for Architecture. To attend, please RSVP here by Tuesday, December 11th, 2018. A wine reception will follow the event. If you’d like to join Storefront’s membership program in order to attend the tour, see here for more information and email membership@storefrontnews.org.